This is an In Person Signed Colour 10" x 8" Photo of the popular British Golfer often referred to as " Monty ". 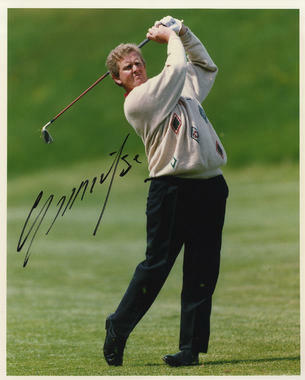 Colin Stuart Montgomerie, OBE (born 23 June 1963) is a Scottish professional golfer often referred to by one of his nicknames 'Monty'. He has had one of the finest careers in European Tour history, having won a record eight Order of Merit titles including a streak of seven consecutively from 1993 to 1999, and 31 European tour victories, placing him fourth on the all time list. He is renowned also for both his extraordinary Ryder Cup performances as well as the dubious distinction of being one of the most accomplished players never to have won a major championship after finishing runner-up on five occasions. His career high world ranking is second.